Background: The goal of prenatal care is mother's and baby's health. Pregnancy is the time of hormonal changes, which cause endocrine disorders in pregnant woman encountering risk to the mother and fetus. Two important and more common problems in pregnancy are gestational diabetes mellitus (GDM) and thyroid disorders. Approximately 1.1-14.3% of pregnant women suffer from GDM and hypothyroidism affects 2.5-6.47% of them. There are some recommendations for diagnosis and screening of GDM but there is no clear advice about the need for performing thyroid function tests during pregnancy. In this study, we aimed to evaluate the need for measurement of thyroid function tests in pregnant women with GDM. Materials and Methods: In this case-control study, 210 pregnant women (105 with and 105 without GDM) were enrolled during 2011-2012 and serum levels of free thyroxine (FT4) and thyroid-stimulating hormone (TSH) were compared between two groups. 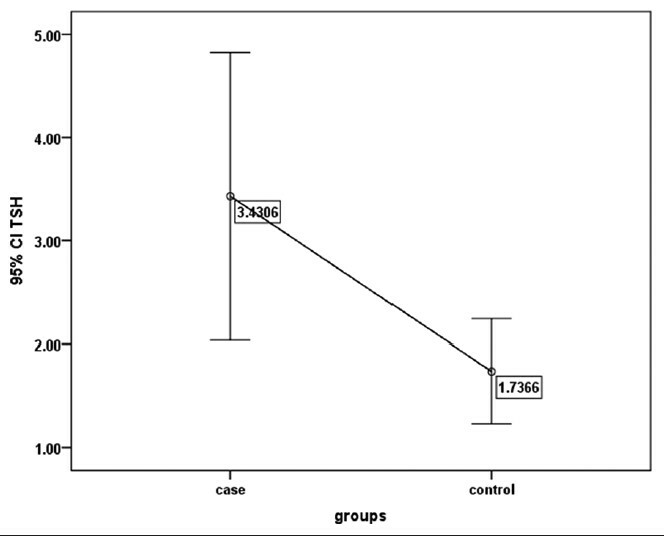 Results: Mean TSH levels in case and control groups were 3.43 ± 2.06 and 1.74 ± 1.47 μIU/mL, respectively and was statistically higher in case group (P = 0.023). Mean FT4 levels in case and control groups were respectively 1.41 ± 0.69 and 1.5 ± 0.61 ng/dL, which were not statistically different in both groups (P = 0.67). Among patients with GDM, 18 (17.1%) had subclinical hypothyroidism and 11 (10.48%) had clinical hypothyroidism, while among non-GDM patients, 7 (6.66%) had subclinical hypothyroidism and 4 (3.81%) had clinical hypothyroidism. Conclusion: In patients with GDM, hypothyroidism (clinical and subclinical) was obviously higher, the mean serum TSH level was higher in these women, and it was within a range that required treatment. So, it is suggested considering screening and treatment of hypothyroidism in patients with gestational diabetes. Objectives: To evaluate the incremental diagnostic value of iodine-131 single-photon emission computed tomography/computed tomography ( 131 I SPECT-CT) compared to planar scintigraphy in patients with differentiated thyroid carcinoma (DTC). Materials and Methods: The study group consisted of 117 patients (Age group = 7-81 yrs; 70 females, 47 males) with DTC; post total thyroidectomy. A diagnostic dose of 111 Mbq (3 mCi) 131 I was administered and planar scan obtained after 48 hrs. Foci of uptake in planar scan were classified as thyroid remnants, lymph nodes, lung metastases, skeletal metastases, distant metastases or of indeterminate etiology. Single-photon emission computed tomography/computed tomography (SPECT-CT) of these areas was then acquired on a dual head gamma camera and reclassification was done. Results: Planar scans depicted 218 foci of 131 I activity classified as 194 neck foci and 24 distant foci. Incremental value of SPECT/CT compared with planar imaging was found for 72 of 194 neck lesions (37.1%) and 24 of 24 distant foci (100%) for a total of 95 of 218 iodine avid foci (44%). SPECT/CT findings led to down staging of 44 of the 72 foci from equivocal or lymph nodes to thyroid remnant and upstaging of 18 of the 72 foci from equivocal or thyroid remnant to lymph node involvement. An additional 8 of the 72 foci were reclassified as physiologic dental or salivary gland activity. The remaining 2 of the 72 foci was found out to be contamination on patient's skin. Conclusion: 131 I SPECT-CT provides increased diagnostic information compared with planar imaging alone, which may alter the patient management. Objective: The aim of this study was to evaluate the etiology, clinical profile and response to treatment in physical, sexual and psychological aspects in juvenile hypo and hyperthyroidism. 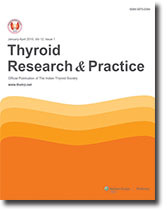 Materials and Methods: 63 patients of newly diagnosed overt hypothyroidism (TSH > 15μIU/ml and T4 < 5.5μg/dl) and 5 patients of hyperthyroidism (TSH < 0.1μIU/ml and T4 > 12μg/dl) in 8-16 years age group presenting with various symptoms are followed for 1-2 years after starting treatment with levothyroxine/carbimazole. Dose was adjusted to maintain TSH/T4 in normal range. The response to treatment is monitored by physical, sexual and intellectual parameters. Results: Among 68 patients, 63 (92.6%) are overt hypothyroid and 5 (7.4%) are hyperthyroid. The age group included was 8-16 years. Among hypothyroid patients, puberty was attained within a year of treatment in patients with delayed puberty. There was improvement in cognitive function with treatment though statistically not significant. Positive TPO antibodies was associated with low T4 and high TSH (P < 0.05). Among hyperthyroid group (5 patients), chief complaints are goitre in 100%, weigt loss in 100% and proptosis in 60% (3 patients). 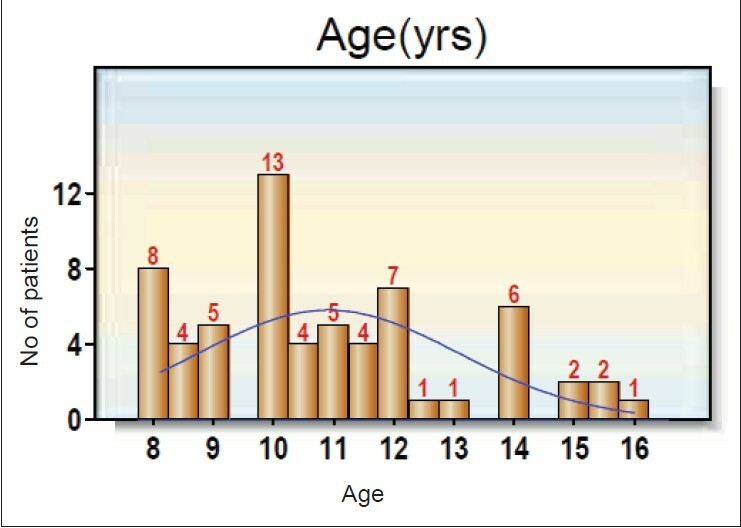 Sexual maturity was appropriate for age Bone age was appropriate for chronological age. There was no significant difference in cognitive function with treatment. Conclusion: In juvenile age group, most common cause for hypothyroidism is Hashimotos thyroiditis and hyperthyroidism is Graves disease. Goitre and growth retardation are commonest mode of presentation of both hypo and hyperthyroidism.TPO antibodies is associated with severe hypothyroidism (low T4 and high TSH). Even hyperthyroid children presents with poor height gain. Height velocity and sexual maturity improve with treatment. Cognitive function was not significantly affected in hypo or hyperthyroidism. Hyperthyroidism is a frequent endocrine disease that can arise from different etiologies. The corresponding etiology needs to be diagnosed for appropriate management since the condition is associated with increased morbidity and mortality. 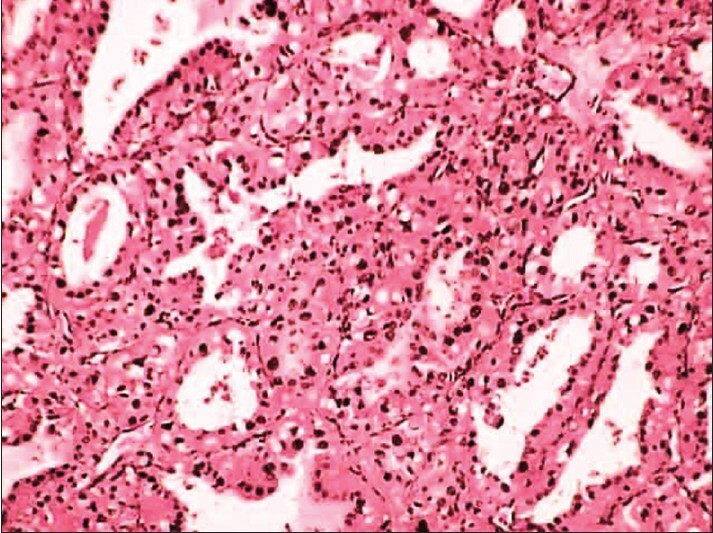 Although Graves disease is the most common cause of hyperthyroidism, exogenous iodine contamination (EIC) should also be considered in the diagnosis set-up. Amiodarone treatment and radiological contrast agents constitute the two most prevalent sources of EIC. However, in the absence of the known causes, thorough investigation is mandatory as the culprit may be a common but unusual source, as illustrated by the present case report. Hyperthyroidism is a commonly encountered endocrine disease that can be associated with a wide array of symptoms. Among the latter, rythmological manifestations are relatively frequent and comprise mainly supraventricular tachycardia (atrial fibrillation, flutter, sinus tachycardia, and atrial tachycardia). However, very few ventricular dysrhythmias have been described in literature. 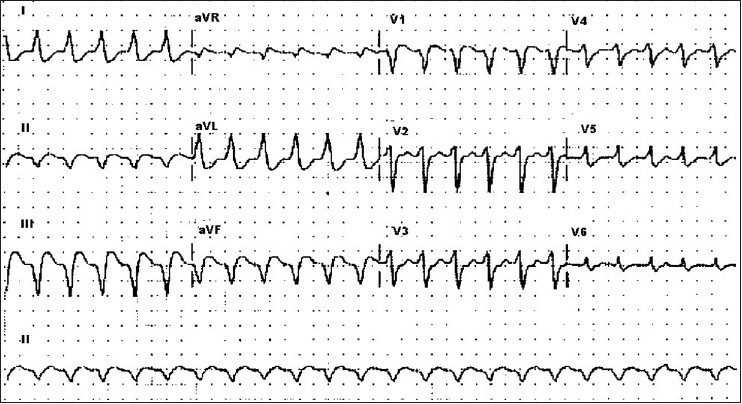 We report here the case of a woman in her late fifties who presented hemodynamically well-tolerated ventricular tachycardia in a context of thyrotoxicosis due to iodine overload. Antithyroid drug therapy is still a widely used approach in the management of hyperthyroidism. Histomorphological changes of thyroid in toxic goiter, following carbimazole therapy are rarely documented. 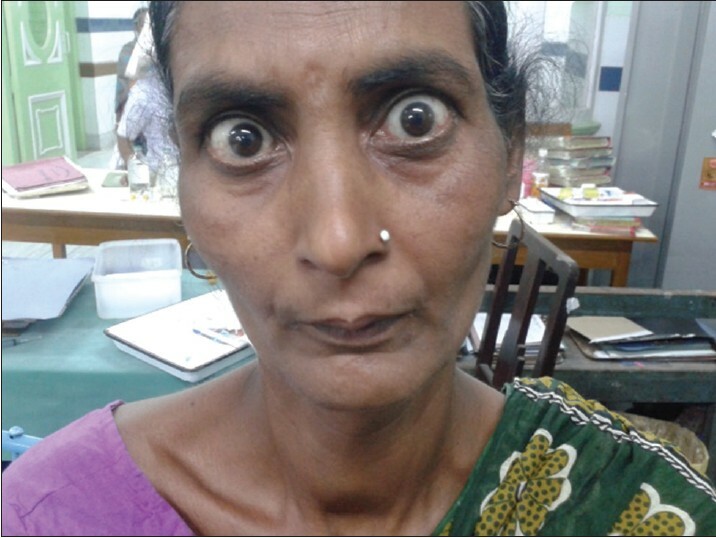 We present a case of 51-year-old female patient who clinically presented with features of thyromegaly. Initially a diagnosis of mutinodular goiter with follicular hyperplasia and in places raising even a suspicion of Hurthle cell neoplasm was made. Correlating the clinical details, history of drug intake, and histomorphological features; a final diagnosis of therapy (carbimazole) induced changes in toxic goiter was offered. A number of non-thyroidal masses can mimic thyroid nodules. A through preoperative work-up is crucial to help differentiate the origin of the mass which is useful in planning surgical intervention and avoid any iatrogenic damage to the thyroid gland. 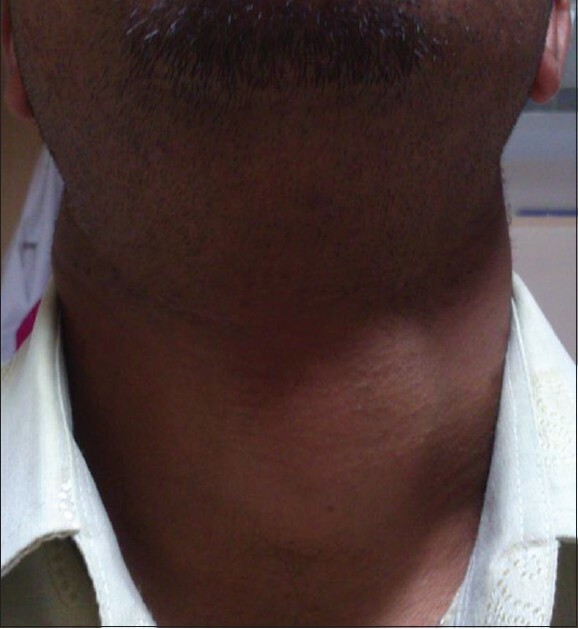 We present a case of a neck mass in a 24 year male clinically mimicking a thyroid neoplasm. Careful preoperative imaging and fine needle aspiration suggested the non-thyroidal origin of the mass. Complete surgical excision of the mass revealed the final pathology as an epidermal inclusion cyst. Hyperthyroidism in children is rare. The purpose of this study is to present a case series enlightening various symptoms of hyperthyroidism along with review recommendations in the literature concerning hyperthyroidism in children. We report 6 children aged (2 years to 14 years) presented to us with various manifestations of hyperthyroidism ranging from acute encephalopathy to exopthalmos and diarrhea. Among them 4 were female and 2 were male. 4 children (2 male and 2 female) had Graves's disease, 1 had toxic nodule on left lobe of thyroid and the other child had transient hyperthyroidism due to thyroiditis. Case 1 presented with thyroid encephalopathy. The adolescent girl mentioned in case 3 presented with menstrual irregularity. All children were started on antithyroid drugs and beta blockers. 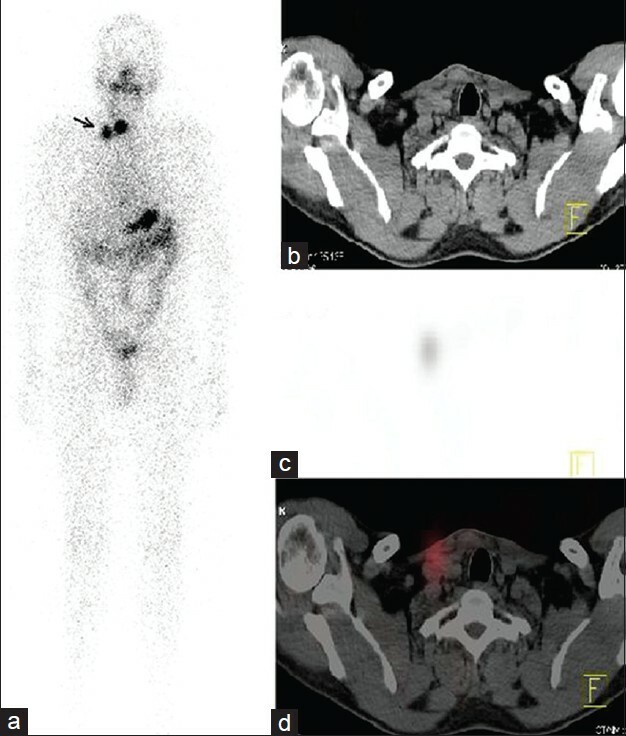 Case 3 had undergone radioactive iodine ablative therapy twice for uncontrollable symptoms.